Those of us who were around for the 1980s (hockey-wise) will remember that it was a pretty dark period for the blue and white. Oh, there were some nice moments. I seem to recall that we won a couple of playoff series (three–out-five first-round series, in those days) but I’m trying to remember if we actually ever won a single best-of-seven playoff round at any point that decade. Maybe one? In any event, it was tough sledding, for the most part. The early ’80 were particularly difficult, despite some talented young players like Miro Frycer making things exciting sometimes. Those were very poor teams, though we had plenty of talent, and some offensive firepower with forwards such as Frycer and Peter Ihnacak (left), Ricky Vaive, Bill Derlago and John Anderson. Later came Wendel Clark, and along with Gary Leeman, Russ Courtnall, Al Iafrate and all-in guys like Brad “Motor City Smitty” Smith and a few others like him, the Leafs were often entertaining—if not always successful. Against that backdrop, one of the goaltenders who made many of the Leaf games a little less miserable than they otherwise would have been was a particular favourite of mine through a good chunk of the ‘80s. His name was Allan Bester. Bester was a “local” kid, in Toronto terms, in that he was born in Hamilton, Ontario. He played his junior hockey in nearby Brantford. He represented Canada at the World Junior championships before it became the huge event it is now. He was drafted and developed by the Leafs, but unfortunately played here at a particularly dysfunctional time in Leaf history—or at least that’s how it felt for a lot of us as Maple Leaf supporters. It was the last decade of the Harold Ballard era, and it often seemed as though “Pal Hal” was getting a little zanier with each passing year, which didn’t seem to help the on-ice product. Bester generally played second fiddle to another (and much bigger) young Leaf draft choice, Ken Wregget. I was always- as I have said here in this space in the past - a “Bester guy” when it came to choosing between the two young, talented Leaf goaltenders. But the prevailing management wisdom of the time seemed to prefer Wregget, a more conventional goaltender. Bester played with the Leafs as a 19 year-old (not necessarily a good idea by the brass at the time, but that’s the way they did things around here…still do, sometimes). 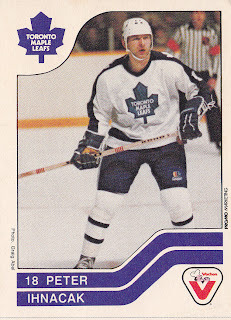 He had been drafted by the Leafs 49th overall in the summer of 1983. He was finally the “number-one” guy in net by the late ‘80s, playing more than half the game for the Leafs in 1988-’89 and 1989-’90. At 5 feet 7 inches, Bester was dwarfed in a big man’s game. But he was a mighty good goalie many nights for some not very mighty Maple Leaf squads. He was traded to Detroit in the early '90s, though he played primarily in the AHL in the Red Wing system. Bester had a nice little run with Dallas as an emergency recall goalie in the mid-'90s before finishing his career in the East Coast League. Matteo Codispoti (We Want a Cup) and I chatted with Allan a few days ago for our “Leaf Matters” podcast. It was a fun conversation. Allan now works in the hospitality industry in Florida (he was a popular player at the tail end of his pro career down in Orlando, and it sounds like he has lived there ever since) and seems to be enjoying his post-hockey life quite a bit. He had some rather interesting things to say about his time with the Leafs, the pressures of playing in Toronto, and new Leaf goaltending coach (and his former Leaf teammate) Rick St. Croix. I hope you enjoy our interview! It was a real pleasure to listen in on your talk with a goalie I really appreciated for his 'never say die' attitude to fight for every save. Truly wished that Wregget had been the backup for longer to gain more of what was inherent in Bester. If Wregget had shown the same desire as Bester (and had the same glove hand), then his size would've impressed me more, but I could never understand why the team didn't play Alan more consistently. I loved the guy... but he was not able to shine for long enough for enough Leaf fans to remember and appreciate him fully. Glad you were able to make contact so we could hear what he had to say and realize the positive impact we should receive from our new goalie coach, Rick St. Croix! Glad to hear that he believes a goalie becoming the best at his own style is the kind of news I love to hear! Funny how a classic stand-up guy (meant both ways) like Johnny Bower would give the same counsel... do what got you here. Amongst all the changes that happen under Burke, I hope that developing players becomes a strength that lasts well into the future. There's a mandate for the team identity you asked us to consider for the Leafs... who are we? Well prepared and properly developed to be the best each can be! Enjoyed my 4th podcast... thanks for pursuing the interview and kudos to you! It's clear that you listened closely to the interview, InTimeFor62. There were, I thought, a lot of little "nuggets" of information that Bester shared that were quite interesting - and revealing!